Do travel and introversion mix? Travel is often portrayed and experienced by many as the ultimate in extroverted experiences. This is especially the case for young budget travelers where hosteling, group tours, high octane socializing, and a continuous stream of new encounters all feature prominently. Most people’s picture of the ideal traveler is someone who dives in head first, takes every opportunity to chat up the locals and fellow travelers, accepts and extends invitations easily, and is generally pretty spontaneous and risk-taking. But travel isn’t just about the people. And it certainly doesn’t require being an extrovert, or straining to act more extroverted in order to appreciate and profit from the wonderful opportunities it brings. 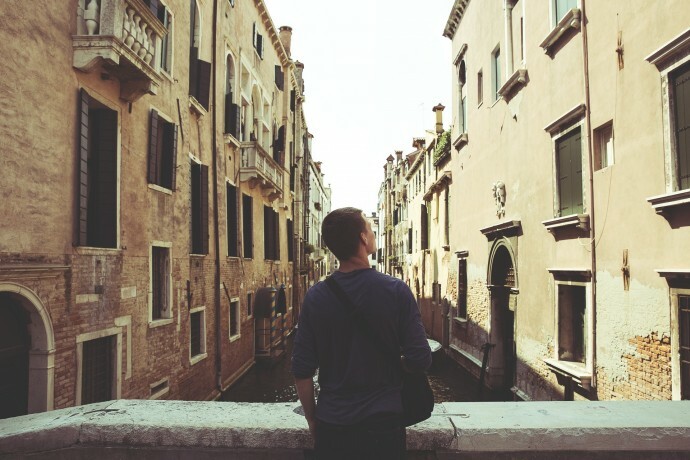 Many introverts harbor a great love of travel, experiencing strong and frequent urges to explore the world beyond their home city and country. But conventional styles of travel can exert serious pressure on our energy levels. Luckily, there is (of course) more than one way to see the world, and it is definitely possible to immerse yourself in new places and cultures while honoring the needs and preferences of an introverted temperament. In fact, I would argue that being an introvert brings many advantages when it comes to travel. What makes introverts great travelers, and in ways that perhaps more extroverted explorers are not? What makes introverted travelers different and what can we learn from them? Travel lends itself well to an introverted mindset in many ways. Perhaps most obvious, especially when it comes to solo travel, is the ability to quite happily spend lots of time alone. Even though traveling involves a great deal of meeting and interacting, it also involves frequent and sometimes long stretches of solitude. Solo travel often means eating by yourself. Lengthy train, plane, and bus journeys spent alone. And sometimes going hours without speaking to a soul, or days without a substantial conversation. Introverts are not only much better at coping with solitude and avoiding loneliness, they’re able to thrive in these conditions, feeling at their most alive and switched on. Extended periods of solitude can also be harnessed for all important reflection, as well as for creative hobbies and personal projects. Meanwhile, extroverted solo travelers — when they aren’t able to find a companion to chat with — are more prone to loneliness, boredom, and restlessness. They are a bit more dependent on having other people around to have a good time, while introverts are generally much more self-reliant and resourceful in this respect. Personally, I can quite happily spend endless hours by myself, sitting alone on a train with nothing to do but gaze out a window, or spending the day exploring a new city without feeling the need to seek out interaction in order to feel energized and happy. A good degree of comfort with solitude isn’t only beneficial in terms of keeping boredom and loneliness at bay. It also offers ample opportunities for introspection, thought-provoking reflections, and perspective changing. Travel can be thought of as a form of therapy, a great tool for personal development which can be harnessed to improve our psychological make-up in certain directions. And I would argue that introverts are generally in a better position to take advantage of this on their travels. For extroverts, it can be tempting to cram all your time with hectic schedules, group tours, late night bar crawls, and various social events. Traveling can get so busy and overwhelming that we’re left with little time to slow down and think more deeply, either about ourselves or what we’re experiencing. Time spent away from home is often a valuable way to reconnect with ourselves and reflect on our lives. It can also help us develop in new and important ways, whether this be through promoting a sense of calm, helping us to move past negative feelings, or learning to embrace uncertainty. All the novel stimulation, interesting conversations, culture shocks, and exposure to different perspectives that travel brings act as great raw materials for the brain. Given adequate time and energy to mull these over, and it can potentially spark creative insights into ourselves – our true priorities, values, and desires – and the various aspects of our lives, from relationships to work. But we need to factor in enough down time to reap the benefits. And this is where introverts are at an advantage. We all need to find the right balance between external stimulation and internal reflection. Travel provides the former in bucket-loads, but it’s up to us to find the time to make sense of the sensory bombardment. Without taking the time to stop and reflect, the benefits of travel are more likely to be short-lived. We enjoy the experience as it’s happening, but within a few weeks of returning home our memories gradually fade, and we all too quickly revert back to the habits and routine preoccupations of normal life. Introverts naturally gravitate towards the reflection side of the equation. So in the context of travel, they act as a natural counter-balancing force. With levels of stimulation and reflection in equilibrium, interesting insights that can be leveraged for personal development are hopefully more likely to emerge. Travel just about always involves a substantial amount of meeting and interacting with new people. Most people will be curious about you, especially if you’re traveling alone or doing something unusual or impressive such as a long-distance cycling tour. They’ll ask for your name, where you’re from, what you’re doing, where you’re going next, what you think about their country, and so on. While extroverts usually welcome frequent, upbeat interactions with lots of different people, regardless of whether there’s much depth or meaning, most introverts really dislike small talk. So these sorts of brief, repetitive, surface-level interactions can quickly become both draining and a source of irritation. But it may be possible to turn this into an advantage. As introverted travelers we should try to capitalize on our strengths. We’re good listeners, more likely to take the time to get to know a person really well, and we’re not reluctant to discuss unusual or deeper issues. We also favor one-on-one interactions that tend to be more about genuine connection, whereas extroverts prefer group socializing where friendly banter and enjoyment generally take precedent. So introverts naturally favor interactions that are more likely to lead to thoughtful, revealing and perhaps less common-place discussions, paving the way for a deeper understanding of the people and places you’re witnessing. We’re also more likely to follow-up and maintain connections with the people we have met once we’re back home. Of course, all this represents just the tip of the iceberg! There are plenty of other factors that make introversion and travel a good match. We tend to make great researchers, have solid organization skills, and good attention to detail. We’re more likely to be well-informed pre-departure, which helps us make the most of the trip, as well as meaning that we’re hopefully less likely to fall prey to mishaps that might result from excessive risk-taking or lack of planning. Many of us find pleasure in the absolute freedom and comforting anonymity that solo travel brings. Our observant nature also helps us to pick up on the finer details of our environment and to soak up all the sensory aspects of travel. Are there any other aspects that make introverts well-suited to travel? I’d love to hear your thoughts! Sian is a freelance writer and blogger at www.sianatkins.com , crafting content on travel, personal development, nutrition and the outdoors. She also runs Introvert Ideal, a site dedicated to cultivating understanding, shifting attitudes and enacting change in society for the benefit of introverts and highly sensitive people.